The old behemoth pecan that lies two feet over in the neighbor's yard. Over 50% of the canopy overhangs my yard. I am super upset about this. I love this tree. I love that it keeps my house and yard cool in the summer. I love that it was a haven for birds and squirrels. I'm pretty sure an owl was dropping animal viscera onto my porch from one of the huge overhanging branches on multiple occasions last year. Gross and cool at the same time. I love how it has lived through storms, the worst being the tornado that came through Cabbagetown in 2008. A lot of other huge trees were felled by that tornado, but this guy stood strong. I called the tree company to see if they had a permit. 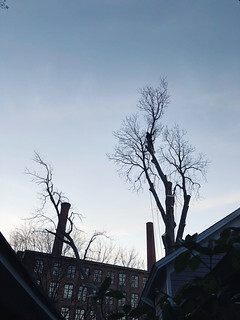 I called the city to see if the tree company was telling the truth. I spoke to the arborist who said one half of the tree rotting and could have broken at any time...the half over my house. I don't care. I shed tears for it. I loved this tree. I tried to fight for it. It will be missed.